Essential Oils. I've heard a lot about them lately, and I'm guessing you have too. I can't go online without seeing a post about them somewhere. I've bought several oils myself but actually haven't used them much at this point. I'm still reading up on safety, especially when it comes to use around small children, before I dive in. 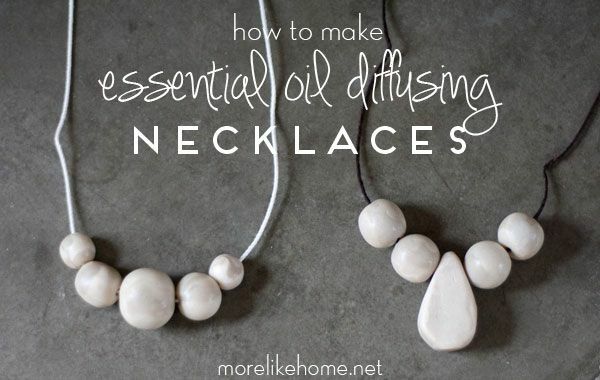 But there are a few I already feel comfortable using so when a friend taught me how to make these essential oil diffusing necklaces I had to give it a try! They are easy and cheap to make, plus you can make any style you can dream up. 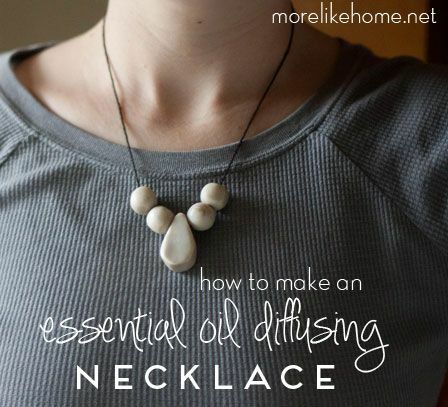 I love the idea of a diffusing necklace because, from what I've read, diffusing is one of the safest ways to utilize essential oils and through inhalation your body still gets most of the benefits of the oil! And since it's a small, personalized diffuser I can use a minimal amount and get the benefits without having to diffuse into the whole house. This is a great benefit as well because I don't feel good about using oils in any way around children under age two, and very minimally for a few years after that. If you're looking for more info on EO safety for children, Learning About EOs has done third-party testing (not sponsored by an oil manufacturer) and offers conservative recommendations for use around children. They also have an age-appropriate anti-germ and anti-congestion recipe for children that could be used with older children on their own diffusing necklace when they are under the weather! This is going to be easy and fun! Ready? 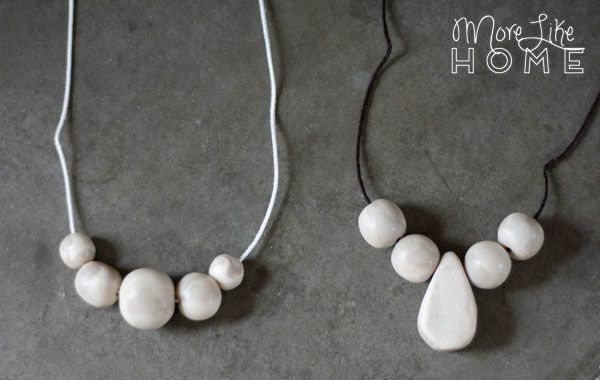 Just shape your clay into whatever shape you like for your beads. I did simple balls, plus one teardrop bead. I tried to keep everything 1/4 - 1/2" thick. For the balls I used a paring knife to cut cubes from the block of clay then rolled them into balls. Cutting the cubes made it easy to make sure my balls ended up the same size. For the teardrop I cut a slice of clay about 3/8" thick, then used my pairing knife to cut out a teardrop freestyle. 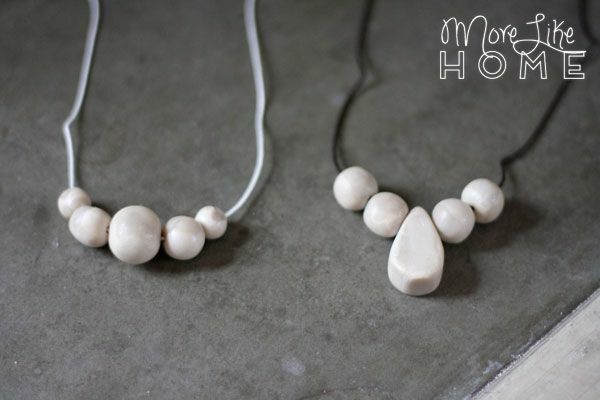 Use a toothpick to poke a hole through each bead (make sure the hole will be big enough for your cord!). Place them on a cookie sheet and bake according to your clay's directions. I had to cook mine a little longer than suggested to get them nice and hard since they were kind of thick. Just keep an eye on it so you don't burn the clay. 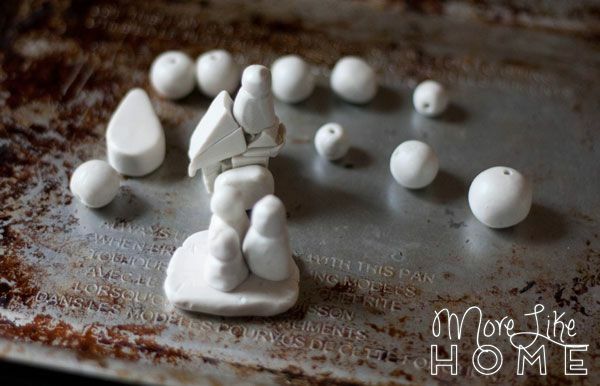 Big Brother used the left over clay to make a few figurines. One is three guys on a sled. For the other he was smooshing pieces together and declared it was a zerba. Then he added "a guy" and some wheels and said "Oh! It's a tractor!" He was so surprised that it turned out to be a tractor. Once the beads have cooled you can string them onto your cord. Cut the cord to the desired length, plus a couple inches for tying off the ends. 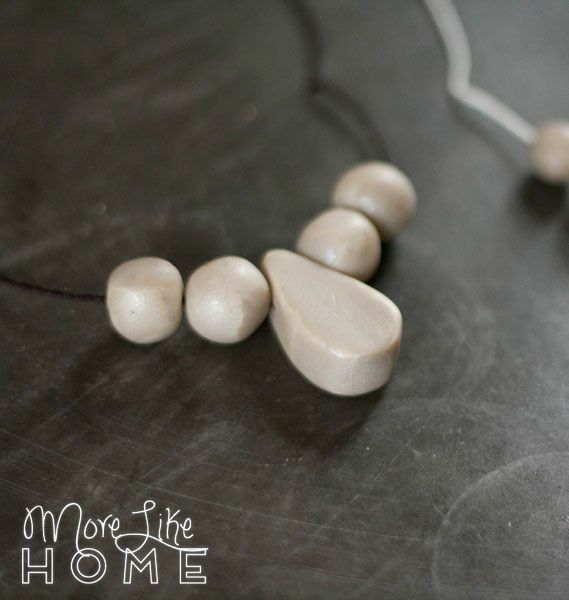 Then tie the ends onto your necklace clasp. I'll say it one more time, check the safety of your oils especially around kids and decide what's best for your family. For me personally, some of the oils I feel safest using are citrus oils like lemon, orange, and bergamot (even around my kids, I put them in my cleaning solutions too). Plus citrus is supposed to be a great mood booster and who doesn't need that during a cold, cloudy winter? They are great to diffuse when you need a pick-me-up. I also plan to make this blend of sweet orange, cinnamon leaf or lavender, and fir when I get sick (a child-friendly version of Thieves or OnGuard oil). If you're really looking to further your education about essential oils, Vintage Remedies is another third party source. They offers multiple courses and emphasize an evidence based look at potential interactions and cotnraindications. A few months ago I got free enrollment in the entry level short course (it came with an ebook bundle I purchased) that looked closely at 12 common essential oils along with practical uses and safety for home use. While I did really enjoy it and learned quite a bit, it was definitely entry level and left me wishing there had been more information about more oils. There are some intermediate and advanced courses that sound really good but all are a far cry from our budget so for now I'll make do on my own. In fact I just ordered this book that was recommended by several friends and is much more affordable. What are your favorite essential oils and how do you use them? If you know any great books or resources for learning about EO safety and use I'd love to hear about it! 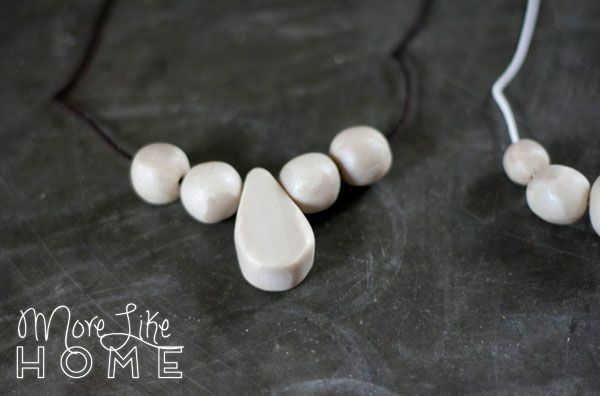 And I would love to see pictures if you make your own diffusing necklace! 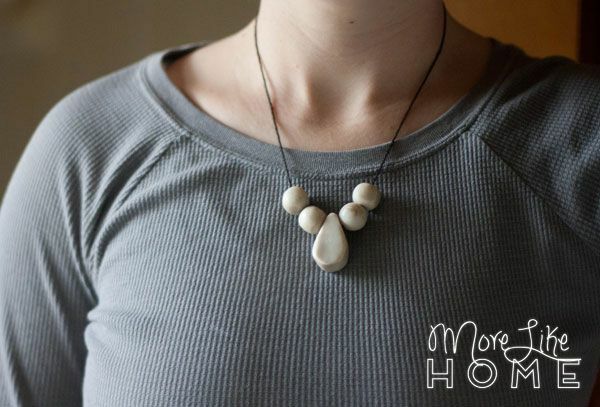 You can post pictures to our facebook page or email them to me at morelikehome (at) gmail (dot) com. I like having one with a "flatter" piece in the middle. I worry a little about possibly staining my clothes, but with the flatter one, I can lay it on my sink, add a couple of drops and let them sink in, and then wear it with the "oil" side out. I can get the benefits of the oil (I use very little so I am not overpowered) and not have the worries about any oils resting on my clothes. I’ve re watched & reread, it seems the reader should just know – sorry I’m new to this your advise would help! I have some Sculpey clay(silver color) left form another project and would like to use it for this but have heard that the oils do not absorb but run off of Sculpey. It sounds like you have had different results? Also wondering if a diy clay (like slat dough clay used for ornaments) would work. Any idea? You can wipe off any excess with a tissue. I haven't found it completely absorbs, but it will still pick up the scent. You could try letting it sit a while too, to see if that helps? :) I would worry about salt dough getting soggy, but I've never tried it and I think it's worth a shot!